Originally featured as our Aldi Meal Plan on PassionForSavings.com this has quickly become one of the most popular meal plans we offer! You can make 10 meals in just 30 minutes! It's perfect for moms who are busy and don't have time for a Freezer Cooking Session because there's no pre-cooking required, everything just dumps into the Bag and then goes straight into the freezer! NOTE: This Meal Plan can be made at any store! The ingredients are available in all grocery stores. This is a Complete Plan with a List of Recipes, Shopping List, Recipe Cards and Bag Labels, everything you need to get started! You’ll have everything you need ready to go, just do your shopping and then prep your bags in less than 30 Minutes! It’s such an easy plan and each Family Friendly Meal feeds 4 or 5 if you have Small Kids like I do! That’s a total of 10 Freezer Meals and you can make everything in about 30 Minutes because there is no pre-cooking required! My goal with this meal plan was to provide you something you can do even on a busy schedule, You can shop for this meal plan and assemble easily on a weekend or week night then you’ll have your Freezer Stocked for all those busy nights when you need to have Dinner ready when you get home! INCLUDES The Full Assembly Video of each Recipe. This has quickly become one of the most popular meal plans we offer! 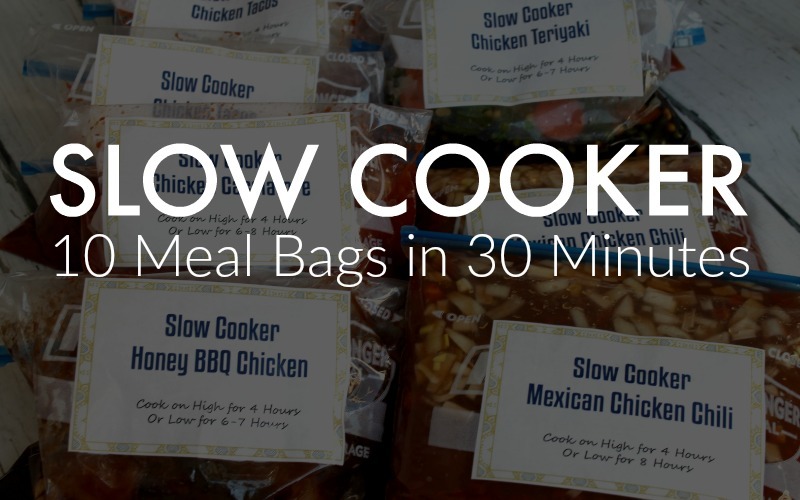 You can make 10 meals in just 30 minutes! It's perfect for moms who are busy and don't have time for a Freezer Cooking Session because there's no pre-cooking required, everything just dumps into the Bag and then goes straight into the freezer!